If you’ve ever searched online for guitar tablature (a popular music notation format used for guitars), you know that it’s a generally miserable experience. First there’s the problem of quality — there’s myriad versions of popular songs out there, and many of them are wrong. But even once you’ve found the tab you’re looking for, actually using it is a pain. The most basic tabs are just text documents, with notes presented using a combination of ASCII characters. That works, but it’s no better than looking at the tab on a piece of paper — you can do much better by taking advantage of the fact that you’re viewing the tab from a computer. Now an experiment on Mozilla’s Hacks portal, which showcases neat things that are being done with Firefox, gives a glimpse of what tabs could look like in the future with the help of HTML5. You can try out the demo here, though you’ll need to be using a recent version of Firefox. Now, seasoned guitar players already know that there are applications like Guitar Pro and Power Tab that are much richer than standard ASCII tabs — these can actually play the song back to you while simultaneously showing which note is being played. These apps also generally support looping, slower playback and other features that make learning a song easier. There’s just a few problems: some of these applications aren’t free, there are multiple competing file formats, and having to actually fire up a separate application to open a tab is annoying, especially when you’re not sure if the tab is accurate in the first place. The experiment showcased on Mozilla’s blog appears to solve at least a couple of these problems. 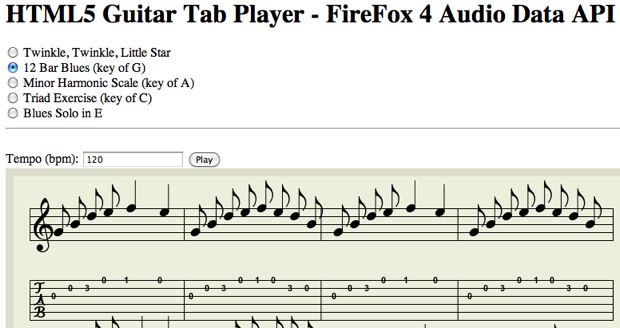 In his post, Illinois State grad student Greg Jopa writes that he used a combination of tools to build it: the Firefox 4 Audio Data API, MusicXML, and an opensource project called Vexflow to present the tabs in the browser, no download required. Obviously there’s still a long way to go — this will only work in Firefox, and the music being played back sounds more like a cell phone ringtone circa 1998 than a guitar. But hopefully it’s sign of things to come. For the time being there’s another solution for playing your guitar tabs in the browser: a startup called Songsterr features a pretty slick Flash-based player.